Agonda beach in South Goa bowled us over with its tranquil charm and it is the perfect getaway if you are looking for a quiet beach holiday in a picture perfect setting. 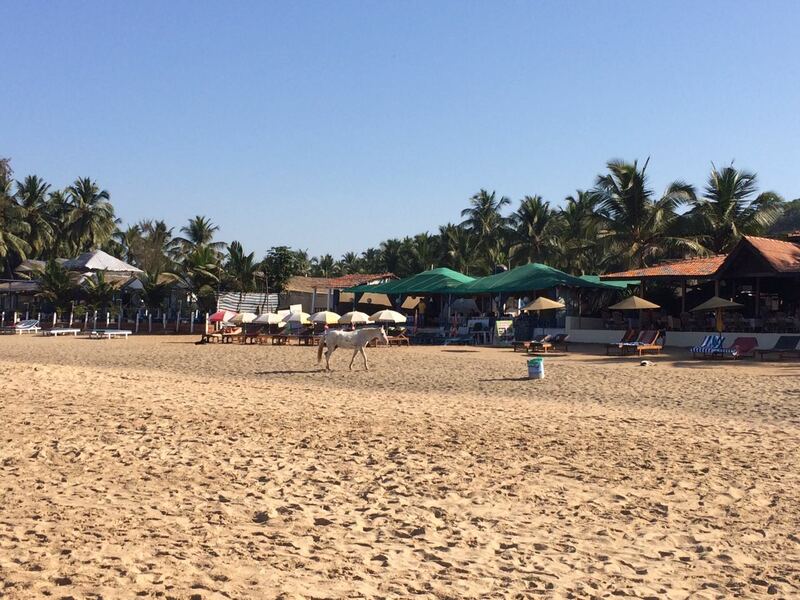 South Goa is always the winner when it comes to a quiet beach holiday away from the cacophony of the urban jungle. 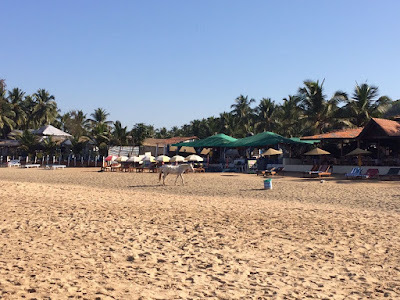 The farther down south you go, the more awesome the beaches get, and trust me, once you get the hang of these south Goa beaches, you would definitely go back there on your next trip. Agonda beach is less crowded and serene than its neighbor, the Palolem beach. 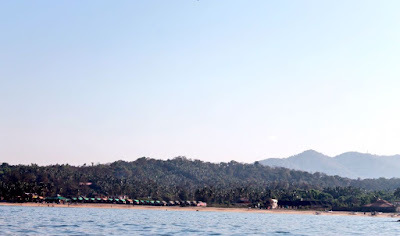 Palolem is equally beautiful on the nature and landscape parameter but is little more crowded due to the presence of larger number of commercial establishments. It is this very absence of sounds and people that makes you take notice of the surroundings at Agonda. This beach has been listed as the best Indian beach in the TripAdvisor ratings of 2017 and we are not surprised! When we reached our resort, we were given access to wi-fi but the connection was too poor. Though a little disappointed, I was confident about my mobile 4G services which let me down too. We realized that we were going to spend the weekend without internet or TV - something which we hadn't done in a long time, but the pleasures of which we were to discover soon. We stayed at the Agonda Cuba resort which has very basic but beautiful beach huts. We stayed on the upper floor and that gave us a nice view of the beach and the surrounding panorama. As I sat looking at the beach, all I could hear were the waves and nothing else, save the occasional swaying of the coconut trees in front. As we sat clicking pictures and chatting, the magic of Agonda slowly descended upon us; and yeah for once I was happy for the absence of internet! Agonda beach has no party places and no loud music is allowed after 10:00 since it is an olive ridley turtle nesting site. As for the water sports and activities, it is good enough for swimming though not the best since the waves are slightly rougher and the beach gets steeper within a short distance. Surfing, kayaking, fishing and boat trips are the most popular activities here. Horse rides are also offered to tourists to a limited extent, especially in the evenings. Taking a walk down the beautiful beach is a relaxing experience too. As we took a stroll around, we saw people enjoying a true vacation - relaxing on beach beds, sun bathing, reading books, children building sand castles and happy pets enjoying a walk with their owners. There were no busy tourists lost in clicking selfies and pictures hurriedly, so they could move on to their next location, or youngsters glued to mobile screens. While my husband chose to go for a swim, me being the I-Just-Enjoy-looking-at-the-sea kinda person, found myself a beach bed and settled down looking at the people and the beautiful sea. A little boat then caught my attention and I inquired about the boat trips. Soon, a boat trip organised was summoned by the hotel staff and a trip to the adjacent beach early next morning was planned. Though it was a sunny day, the night was unusually cold. I decided to take a night walk down the beach and was thoroughly rewarded with the cool soft sand under my feet and the quiet of the night, punctuated only by the crashing of the waves. As the beach drifted into a slumber, the moon and the stars of the clear night sky glowed divinely, guiding my walk. The morning started with a wake up call from our boat guy Mr. Suraj. He had insisted on taking the ride as early as possible to avoid the heat and also increase our chances of spotting the dolphins. So here we were, jogging along the beach to reach the boat at 7:00 a.m in the morning. 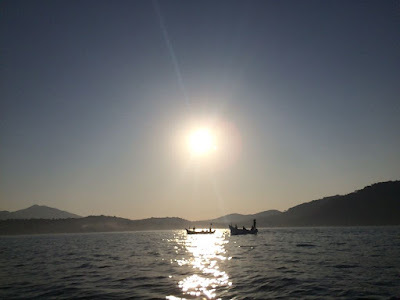 As the sun rose up the hills in the distance, we hopped onto the boat, all eager to explore the 'secret' beaches - The butterfly beach and the Honeymoon beach. 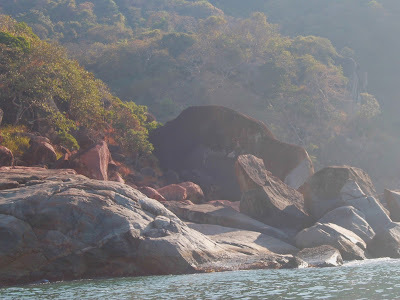 These beaches lieing between Palolem and Agonda have no land access to the beach, so the only way is to take a boat ride. As the little boats's motor sprung to life, away we drifted from the beach, taking in the beautiful landscape. A Little into the sea, we spotted a dolphin and the boat's motor was switched off not to disturb the dolphins around. 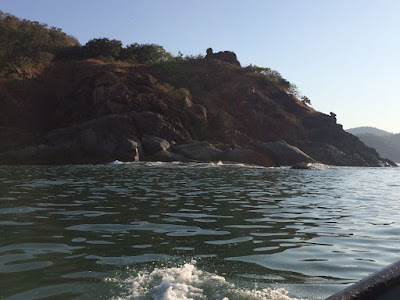 As we sat in the boat gently rocking to the waves, in a span of 15 minutes, we caught sight of several dolphins around us, merrily hopping along with the waves. We did try to take a picture but after a couple of failed attempts, we just decided to stop and just enjoy watching the beautiful creatures. We then proceeded towards the beaches, the sea breeze cooling us, as the sun began to warm up everything around. 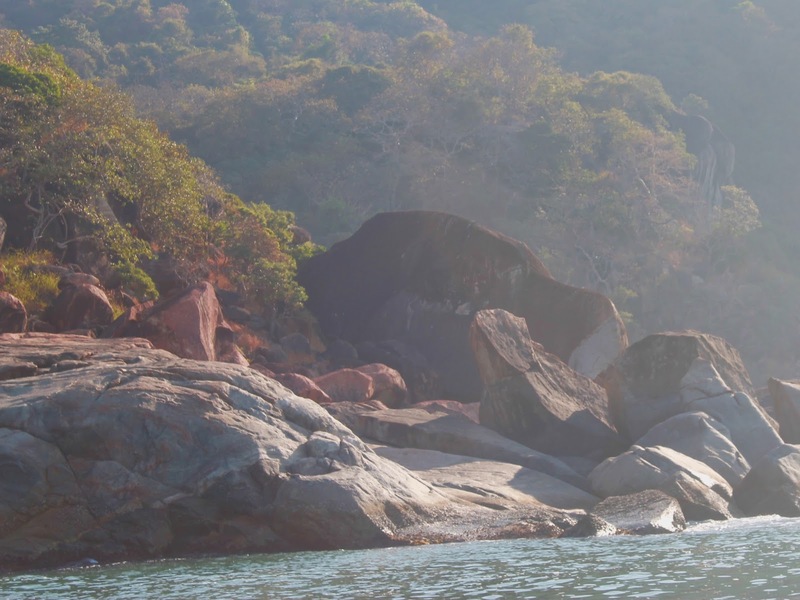 Several rock formations characterize the bay between Agonda and Palolem, some of which are believed to be as old as the Arabian sea. The ancientness of these beautiful rock structures did not escape us - As we took in the beauty of these gargantuan rock formations of every size and shape, the whole landscape just made us feel so small. It was an incredible experience truly. Can you spot the face of a dog here? The butterfly beach is actually quite small with a rocky landscape. 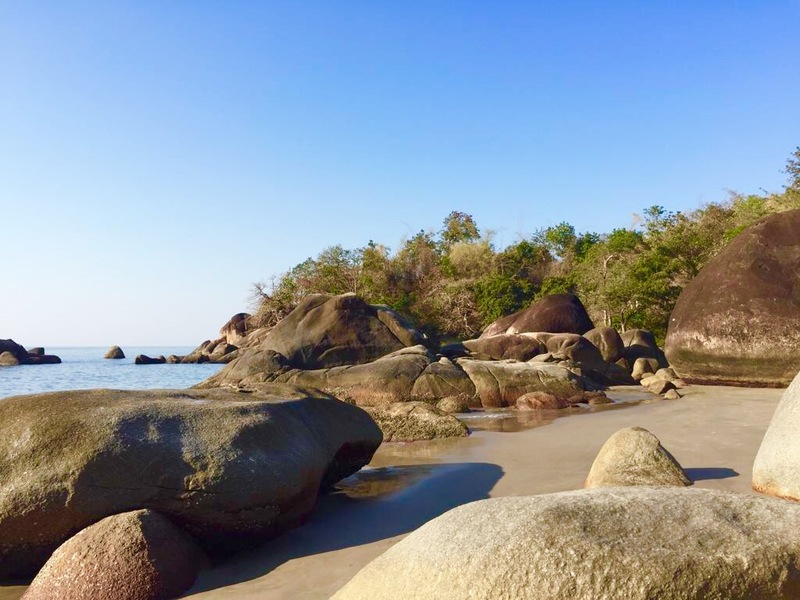 In fact, this beach is not safe for swimming too since the water depth is a bit high but the unusual jungle like landscape combined with the isolatedness lends a unique charm to this place. we didn't stop at this beach but if you wish to, you can talk to your boat guy about it. We then went further up towards the honeymoon beach, a rocky beach, and we did get down at the beach for a while here. If you wanted to disappear off the grid for some time, then these would be your ideal spots! If you happen to visit Agonda, I would definitely suggest this visit to the beaches. If time permits, you can also take a ride to the Cola beach towards the northern side of Agonda. However, Cola beach can be reached by road too. 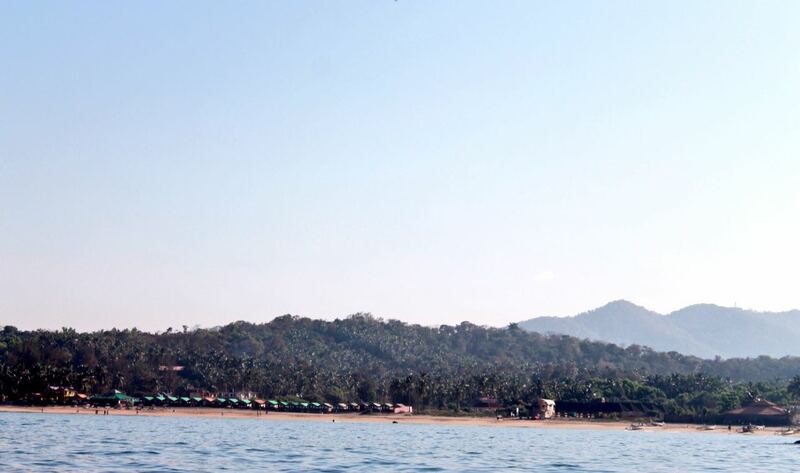 Agonda beach has accommodations mostly in the form of beach huts and eco-friendly cottages starting from 1000-1500. While the basic beach huts are non-ac, you can opt for air-conditioned rooms which are a little pricey. Beach facing huts come at a higher price but the views are totally worth it! The food scene here, though not as eclectic as Palolem, is decent enough, serving both Indian and continental menus. 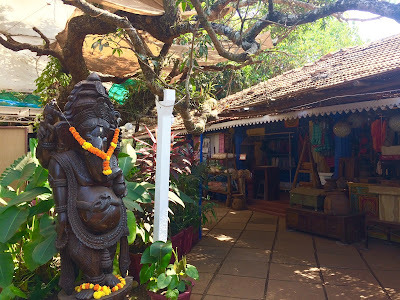 We preferred to have our food at Dunhill, the Agonda's branch of the famous Dropadi in Palolem. For the vegans and veggies out there, do try the Blue planet cafe, about 2 km from the beach. There is also this place called La Dolce Vita, that serves up delicious Italian cuisine. Though not a shopper's paradise, Agonda too has its share of little colorful shops selling all sorts of touristy stuff and souvenirs. Sometimes, you come across really pretty pieces of clothing or accessories here, so keep your eyes open if you love shopping! The sleepy little village of Agonda might not offer much in terms of nightlife, but if you are really looking for a night of revelry, there is the Leopard valley club, about 4km from Agonda beach. However, do not expect a chic, swanky place; this one is set in the jungle, exuding hippie vibes but has a pool and some really cool ambiance. Apart from this, several shacks on the beach, like the H2O, host live music sessions on weekends. There, so your entertainment needs are taken care of. Goa is definitely the place to party away the nights, but a Goa vacay minus the glitzy party scene can be a welcome break; and Agonda offers you that relaxed, peaceful setting to just put your feet up and while away your day by the sea.